Discovered in 1923 by D. Coster and G.C. von Hevesey in Copenhagen, Denmark. 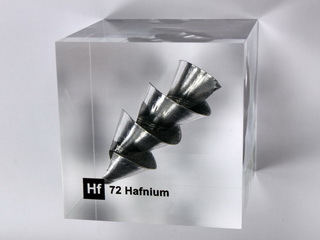 Hafnium is a silvery colored, ductile metal which is found in all minerals containing zirconium. The chemistries of the two metals are similar which makes them difficult to separate, and the properties of each are greatly affected by the presence of the other as an impurity. Both zirconium and hafnium are extracted as the pure metal by reducing the tetrahalide with magnesium, the whole process being carried out under argon as both metals readily combine with other gases (e.g. nitrogen). The abundance of hafnium in the earth's crust is 5.3 ppm. 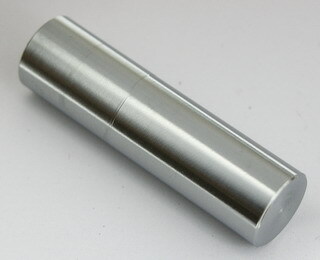 Hafnium will resist corrosion in air due to the formation of an oxide film, although powdered hafnium will burn in air. It is unaffected by alkalis and acids, with the exception of HF. 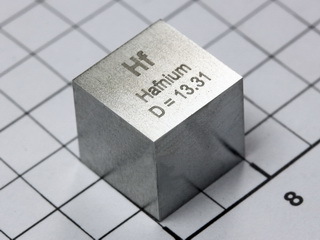 Hafnium can be used to control recrystallization of tungsten filaments but its main application is as control rod material in nuclear reactors due to its ability to absorb neutrons. 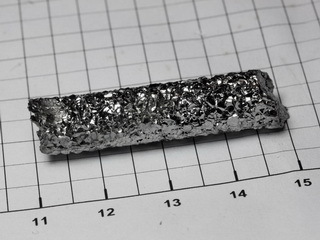 The ability of hafnium to absorb neutrons means that it can sometimes be an annoying impurity in zironium metal which is used for nuclear engineering. Mini-Hafnium Crystal Bar - 31.0g very shiny and clear! Mini-Hafnium Crystal Bar - 37.0g very shiny and clear! Big Hafnium melted nugget, ~ 19.78g, 99,9% purity!